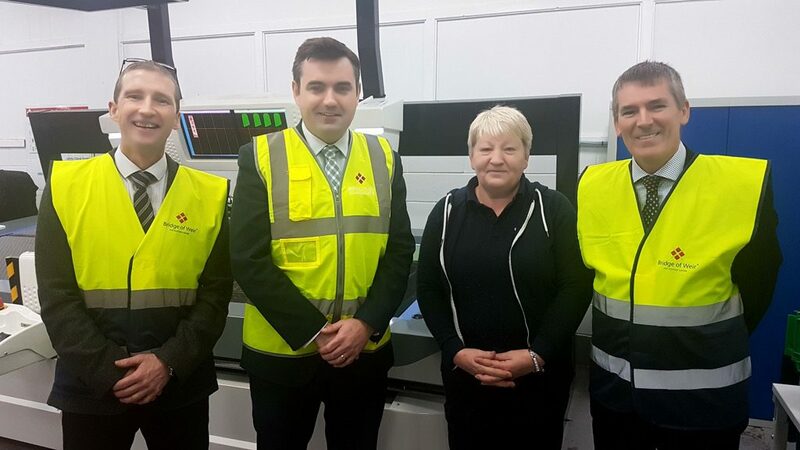 Gavin Newlands, MP for Paisley and Renfrewshire North, has visited Bridge of Weir Leather, part of Scottish Leather Group, on their site to find out more about the business and to hear their concerns about Brexit. Bridge of Weir Leather is the UK’s only leather manufacturer for the automotive industry, and as part of the Scottish Leather Group operates one of the largest tanneries in Europe exporting to over 60 countries around the world. They supply leather to brands including Volvo, Jaguar Land Rover, Lincoln and Aston Martin. Gavin Newlands commented: “I’m grateful to Iain and his team for taking the time to meet with me and for the very informative tour of the site. Bridge of Weir Leather have gone from strength to strength in recent years and it was interesting to hear how they have managed to grow the business, essentially doubling their turnover in the past few years. With that growth has come jobs. With nearly 1000 employees across the group, they have a significant impact on the local economy and are seen as one of Scotland’s leading companies. “Bridge of Weir Leather raised many of the same concerns businesses have highlighted to me about Brexit and what challenges the uncertainty has brought to them. Their main competitors are in mainland Europe, which makes the current lack of clarity and the threat of possible no deal scenario extremely worrying to them.